Remember, back in June, when we pointed out that violent communists were recruiting on campus and that it would bear poisionous fruit this fall?!? The protester was Latin American studies graduate student Eric Nava-Perez, who joined fellow students Friday morning to protest anti-sanctuary city legislation and support immigrant rights. Journalism sophomore Chase Karacostas was covering the protest when he was struck at around 11:30 a.m., just as the protesters began marching to the Texas Capitol. Police arrested Nava-Perez on Speedway in front of the Blanton Museum. University spokeswoman Cindy Posey said Nava-Perez was booked into the Travis County Jail shortly after. Roughly 25 protesters gathered that morning in opposition of Senate Bill 4, a piece of Texas legislation requiring cities to comply with federal immigration authorities and authorizing local law enforcement to question a person’s immigration status during routine stops. A federal judge temporarily blocked the legislation last week. Fifteen minutes after the incident occurred, Nava-Perez was arrested while marching to the Texas Capitol building with roughly 25 other student protesters. Students from social justice campus organizations such as Sanctuary UT and Solidarity 6.04 attended the event, as well as unaffiliated students who joined for personal reasons. You'll notice that Presidet Fenves, Chancellor McRaven, and the Board of Regents haven't said a word. 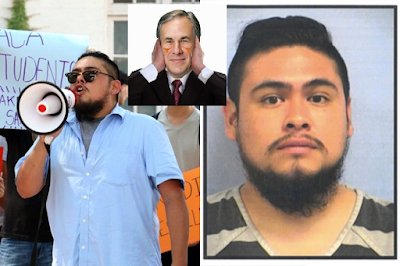 Bottom Line: Following two on-campus murders in 13 months, the University of Texas began the current school year with a politically motivated assault. Unfortunately, we expect more of this until someone cracks down. Have we mentioned that a majority of the Board of Regents have been appointed by Governor Abbott?! ?